15 Fabulous Red Velvet Desserts for Valentine’s Day in a scrumptious collection of red velvet recipes you’re sure to adore! Valentine’s Day is coming up this week and everyone needs one or two ideas for delicious desserts to make for their sweetheart. I offer 15 Fabulous Red Velvet Desserts for Valentine’s Day. But these are also wonderful desserts for any special occasion such as Mother’s Day, birthdays, anniversaries, Christmas and other holidays. Red Velvet makes such a lovely, chocolaty dessert. 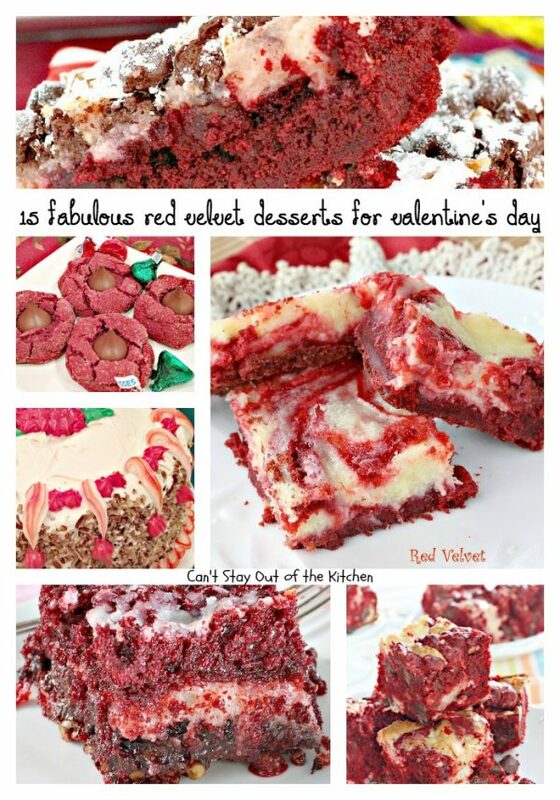 Give one of these delectable 15 Fabulous Red Velvet Desserts for Valentine’s Day a try this week! Thank you, Nancy, they are really yummy. Thanks for stopping by.